Jerry Ballgame digs into his vast sports history knowledge to tell us the story of the Kicker, one of the NFL’s least heralded players. It is generally accepted that the modern NFL was born on the last Sunday of December in 1958, on the chewed up turf of Yankee Stadium. In an overtime battle, often referred to as “the greatest game ever played”, the Baltimore Colts defeated the New York Football Giants, 23-17, to capture the championship. 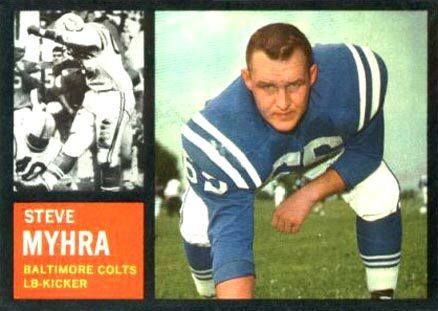 Included on the list of the seventeen future Hall of Famers who were on the field that day are John Unitas, Raymond Berry, Weeb Ewbank (coach) Gino Marchetti, and Jim Parker for the Colts. For the Giants; Frank Gifford, Sam Huff, Don Maynard, and a couple of young assistant coaches by the name of Lombardi and Landry. But despite this impressive listing of stars, it was a reserved lineman from North Dakota, namely Steve Myhra, who with 7 seconds left to play, hit the 20 yard field goal that sent the game, for the first time in league history, into overtime. That’s right, a reserved lineman, and if you are having trouble envisioning a bulky, 6’1”, 240 pound kicker gracefully approaching the ball from the side before swinging his leg into it. Don’t worry, he didn’t. Back in the dark old days of black and white television, not only was the kicker NOT a “specialist” in the way we think of them today, he actually approached the ball straight on! Place kicking, it would seem, might not have been an afterthought, but it certainly was yet to be the “special” part of the game it has since evolve into. As the 2-point conversion in the NFL would not be adopted until 1994, the main job of the kicker was to hit the PAT (point after touchdown), and since the goal post would sit on the goal line and not be moved to the back of the end zone until 1974, that wasn’t all that difficult. A straight on approach that elevated the flight of the ball quickly, was more than adequate for the task. Given that many NFL franchises were sharing space with their baseball brethren, football gridirons were often laid out across the infield dirt. This often caused difficult footing, making a simple one-step, straight on approach, logical. In addition, if you were to browse through the rosters of NFL back before the 1970 merger, you’d discover that kickers often had multiple letters after their name. Indicators that they were expect to play multiple positions, often on both sides of the ball. Some, like Myhra, a linebacker and guard, would only get in for the occasional play from scrimmage. Others, such as Lou Michaels of the Steelers, who started on the D-line. 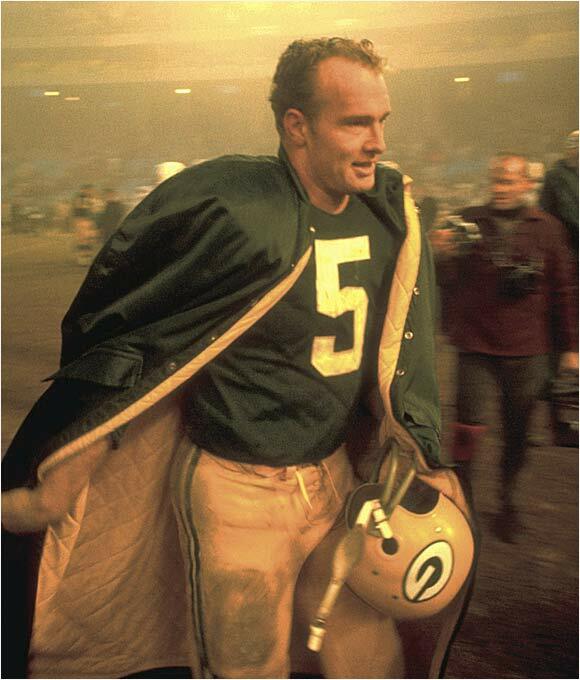 Lou ‘The Toe’ Groza, who was an All-Pro OT for the Paul Brown Browns and the original “Golden Boy”, halfback Paul Hornung, of the Green Bay Packers, were all major contributors in the different phases of the game. Let us not forget the unique case of the ageless George Blanda, who kicked and quarterbacked for the AFL’s Houston Oilers (now in Tennessee) and Oakland Raiders, well into his forties. Of course,” kicker as player” wasn’t true across the board. The golden voiced Pat Sumerall of the Giants, as well as Baltimore Colt Super Bowl V hero, Jim O’Brien, never caught passes despite wearing receivers’ numbers. 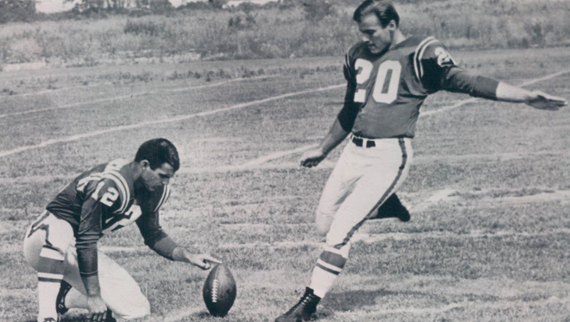 But in the midst of all this, (1964 to be exact), a young man from Hungary, via Cornell University, would show up in Buffalo, and bring a serious change to the look and execution of one aspect of kicking the football. 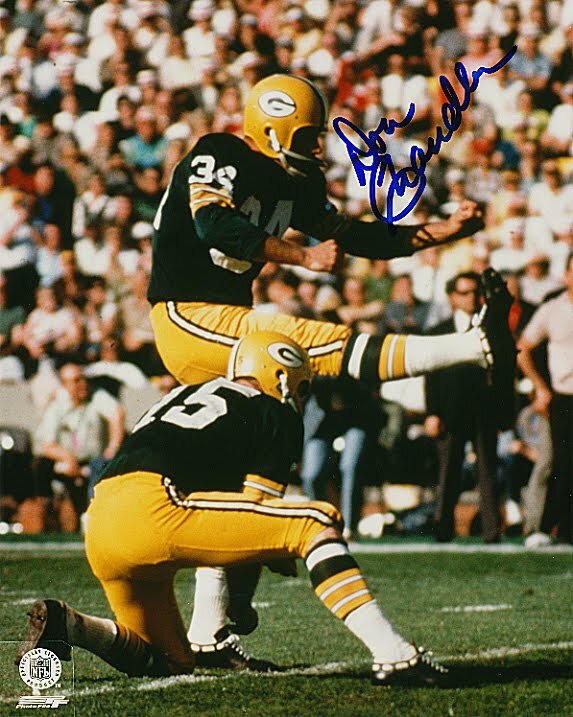 At 6’1”, and 190 pounds, Pete Gogolak certainly could pass for a football player, but his “soccer style” approach to place kicking seemed very strange at the time. (A little like seeing the “Fosbury Flop” approach to high jumping for the first time.) Strange, but effective; after two years with the Bills, he went on to spend nine seasons with the Giants and become their leading all-time scorer with 646 points. Soon, other soccer-style kickers, including his brother Charlie, would join him and eventually dominate the position. Not all at once, (the last “classic” style kicker would be Mark Moseley in 1986), and not without discussion, but it was inevitable. Initially, the debate was efficiency versus accuracy. Proponents of the classical style claimed that their approach got the ball up and out faster, while the supporters of the new approach felt their guys were more accurate, especially at shorter range. Not one to sit idly by, SPORTS ILLUSTRATED, in April of 1967, decided that it would help to settle the question by holding a competition between two kickers of each approach. Interestingly enough, their results gave a slight advantage to the old time technique. Given that the competition was done off tees for the most part, and not during game conditions, draws into question the validity of the exercise, however, one of the participants did say something very interesting. Sam Baker, one of the straight on kickers, said that coaches would be far better off spending time and money on snappers and holders then worrying about kicking approach. Given the value and longevity of long snappers in today’s game, apparently someone listened. Personally, I have to believe, given the failure of the Baltimore Ravens kicker in the AFC Championship game, that maybe it doesn’t matter whether a kicker approaches the ball from the side, straight on, or to a cha-cha beat; it’s what’s between the ears that counts the most. Just like foul shooting in basketball, or putting in golf concentration, confidence, and a steady eye are essential characteristics of successful place kickers. 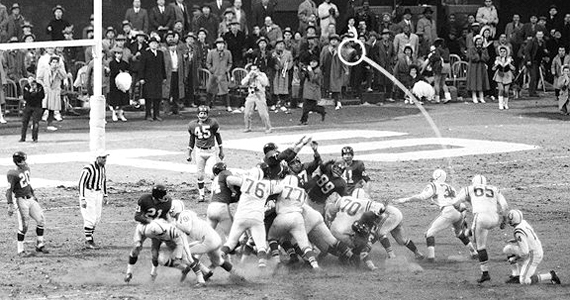 1967 – “Slingshot” goal post adopted in NFL. 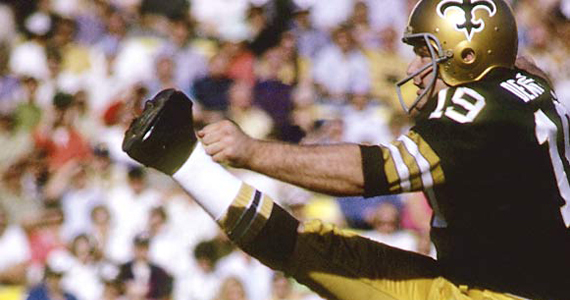 1970 – Tom Dempsey, of the New Orleans Saints, wins a game with a 63 yard field goal. The 6’2” 255 pounder straight on kicker has a special shoe designed to compensate for that fact that he was born without toes on his right foot. ESPN later proves that, because it actually had a smaller surface area than the “normal” kicking shoe, it gave him no advantage. Although tied twice, the record still stands. 1972 – Johnny Carson, on The Tonight Show, utters the famous “I keeeck a touchdown!” after Garo Yepremian’s infamous attempt at a forward pass in the Super Bowl almost cost Miami their perfect season. 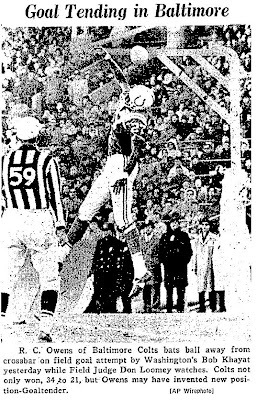 1974 – The uprights are extended, and the goalpost is moved to the back of the end zone. The official NFL explanation is that it is being done for safety reasons, but everyone knows it to make it more difficult on the ever increasingly effective soccer-style kickers. In addition, missed field goals are returned to the line of scrimmage, and not the ‘20’, making long distance attempts more of a gamble. Kick offs are also moved back from the 40 to the 35. 1979 – Tony Franklin of Philadelphia kicks barefoot. 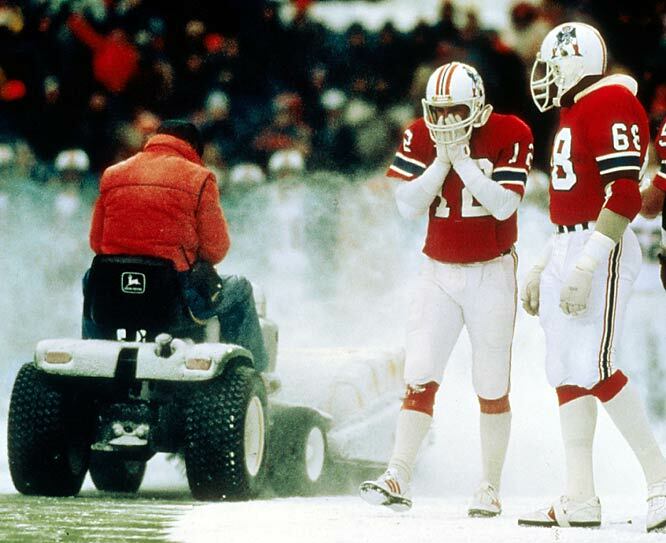 1982 – John Smith of the Patriots kicks a late field goal in a snow storm, against Miami, accounting for the games only points. Some people claim that the sudden appearance of a snow plow to clear the spot he was to kick from had something to do with his success. The NFL later bans snow plows from the sidelines during games. 1994 – The NFL adopts the 2 point conversion. 2001 – Arizona Cardinal place kicker Bill Gramatica tears his ACL while celebrating a first-quarter field goal. 2001 – Adam Vinateiri of the Patriots hits a 45-yard field goal in a driving snow storm to tie up the Divisional round game against the Raiders. He goes on to hit the winning field goal in OT, sending the Pats to the AFC Championship, and eventually the Super Bowl, which he wins with a 48 yard field goal. Long snapper Lonnie Paxton executes the most famous snow angels in history of Massachusetts. 2003 – Vinatieri does it again. 2012 – Baltimore’s Bill Cundiff misses “chip-shot” field goal attempt in last seconds of AFC Championship game.